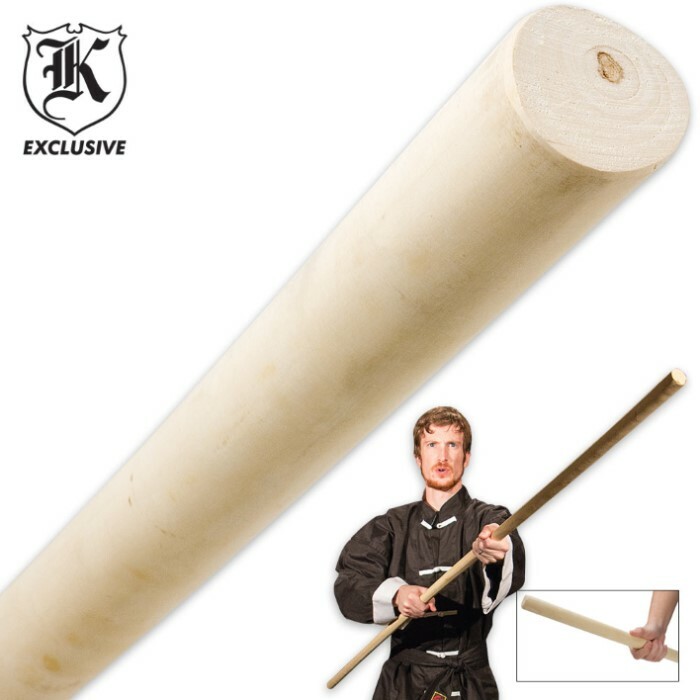 6' Wax Wood Self Defense / Training Staff | BUDK.com - Knives & Swords At The Lowest Prices! Just as expected nice diameter feels good in hands! Get you one they're great staffs! I just received this piece today and must say I am impressed. The wood is heavy and strong. I personally craft walking sticks and other such items out of wood and can easily say the wood is very good. Definitely tapered towards one end, which I came to expect from the reviews, but both ends withstand strikes. 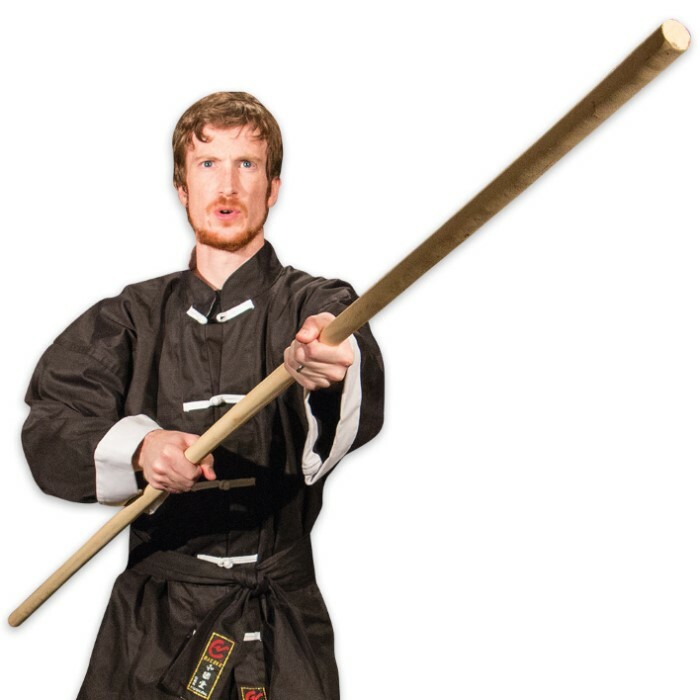 I have read some of the reviews and as a martial artist I think such a fine piece of wood would be wasted on a walking stick or anything of the sort. The only issue I have is it will have to lose about six inches off the top where the wood split upon drying out, which happens frequently when making walking sticks, wizard/Druid staffs or magic wands, so it’s no big deal at all! I ordered two of them. I know they say they're almost unbreakable and from what I've noticed they are tough and flexable depending on it's thickness. One is fairly thick compared to the other. But they're both pretty tough. What I'm having a hard time believing is they are natural wood and you have ton of variables with a natural wood product. We have to expect possible weak spots and expect it to possibly chip when it's smacked against other hard objects. I haven't had any issues but I also haven't tried to knock over a tree with it yet. It's tough, flexible and really straight for a natural tree. I recommend them very highly but they are wood and they aren't indestructible. I'm going to carve on mine. Im not an expert at carving but I will have something very cool when I get done and I will enjoy these alot. All these complaints about this not a proper bo (a Japanese-style staff) are complete hogwash! 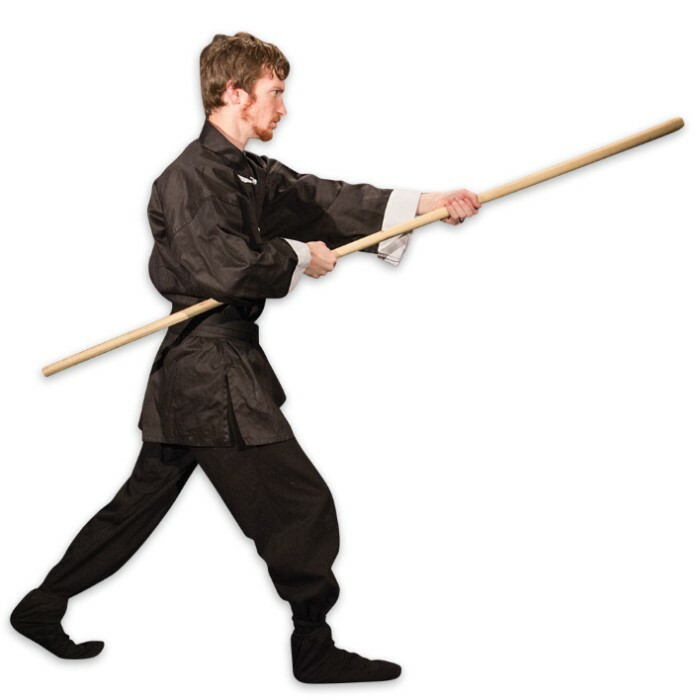 This is a gun (a Chinese-style staff which is used in Shaolin Kung-Fu). The main difference being that a bo has either no taper, or has a double taper (thick in the center and thinner at the ends). Traditionally, the gun would have a single taper which is presented here (in the southern style of staff, or Nan Gun). I did not order this staff, myself, but rather received it as a birthday gift from my Sifu. It is a beautifully-simple and strong staff, and there is only one knot on mine at the very base, which should not affect performance at all. I was able to cut it down a few inches to match my height (5'10") with little to no effort, and the staff moves wonderfully while performing my taolu (the kung fu equivalent of a kata in karate). Overall, a great value. Great staff. Very light, despite it's 6ft length. Noticeable but not intimating to good people. Thugs tend to give pause & look for easier targets. Extremely reasonable price & very prompt delivery. Recommend highly. Half inch at one end tapers down to 3/4 inch on the other end on a 6 foot staff is laughable. No quality control ? Some small bends in the wood to be expected, but the taper is huge, not usable as a Bo staff without MAJOR woodworking. This is a rather nice piece of wood - straight grain, no knots, smooth. At a full six foot it is bit long for hiking in the woods so it will either get trimmed a bit or steamed and bent into a crook. All in all a splendid staff. I read the description, and I understand that your average stick will be thicker at one end that the other, but the staff I received starts out fairly thick at one end, but quickly tapers down, and at the far end is just over 1/2 an inch thick. I bought this to add to a spear tip, but it is not suited for this at all. I gave it 2 stars because I can see that if it had been uniform in thickness, (Like the one in the photo/video I might add!!!?!?!) it would be perfect. I call this a classic bait and switch. I know not all of them will be identical, but you should not pass off sub-standard merchandise on the unlucky few to save a buck. You should have some type of quality control in place. When I ordered it was buy one get one free. After waiting over six months because they were on backorder, I finally got only one staff. I had ordered before and got exactly what I wanted, however this time, not only didn't I get the free staff, I only received one and it was the correct size on one end but tapered down to half the diameter on the other. This shipment was definitely a major disappointment.